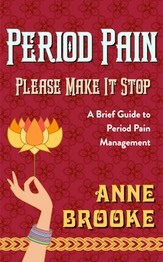 Period Pain: Please Make It Stop (A Brief Guide to Period Pain Management) is published by Anne Brooke Books. Period pain: it can be the most excruciating agony and can really ruin your month, every month. Here then, from someone who has suffered from exactly the same problems as you do, is a list of tips and tricks on how to ease the utterly debilitating symptoms. The wisdom in this little book will enable you to manage the agony of period pain and diminish any future bouts as they occur. It will help turn your miserable months into magical ones!